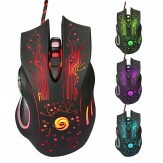 Amazon India selling Gaming Mouse, Pictek USB Wired Mouse 3200DPI 6 Button Optical Sensor Gaming Mouse, 7 Color LED Rs.399 only best and lowest price online.You can follow the below steps to buy this product at their deal price..Keep Visiting dealsheaven.in for more Best offers ,hot online deals, promo code, free deals online,free samples, coupons and discount . High-precision Game IC Mouse: Professional game chips and 3200 DPI gives you unbelievable accuracy and speed to become the overlord in the game. Wide compatibility: windows 7/8/2000 / XP / Vista, Mac OS. Extreme Durable Gaming Mouse: 10 million switches for the 6 button and 5 million swing tests for the roller. Put an end to the button is not sensitive and unresponsive. LED Light Wired Mouse: Rainbow colors changed automatically leads you into the visual game world. Plug And Play Gaming Sensor: 1.5 m braided wire with high quality USB connector is easy to use, soft flexible braided wire allows you easily to wrap and move during your gaming time. Ergonomically Designed Mouse For Gaming: Extra design for relaxing to avoid hand fatigue after a long term using. 12 month warranty. How to buy Pictek USB Optical Wired Gaming Mouse ?